Vengeance, the latest expansion to the Multiverse, is now winding its way to Kickstarter Backers and will soon be in players’ hands (if it isn’t already). That means it must be time for another update to your plucky tabletop companion! As always, this free update to Sentinels Sidekick contains support for all the new Heroes, Villains and Environments included in the new expansion. Vengeance brings some pretty interesting new things to the table, so try not to get too lost in the epicness. First up, a new 5-member villain team-up is available. When playing the Vengeful Five, you’ll be able to switch between each member to access their individual hit points and targets. On iPad, you can also see the HP of each villain at all times. We could explain more, but once you’ve read up and understand how a game flows with this new villain type in play, you’ll understand how it works in Sidekick. Vengeance also brings the first “multi-hero” in the form of “The Sentinels.” Playing with both the Vengeful Five and The Sentinels means there will be just oodles of targets on the table, but Sidekick can now handle it all with aplomb! But can you make it pretty? Simply playing with these new characters is fun enough for some, but for the die-hard fans, we know you want your Sidekick to be just as pretty as the cards on the table. For you, we’ve added the Vengeance & Nemesis Artwork Pack which includes both regular-size and high-res artwork for all Vengeance villains, heroes, environments, and target cards, plus a little something extra. 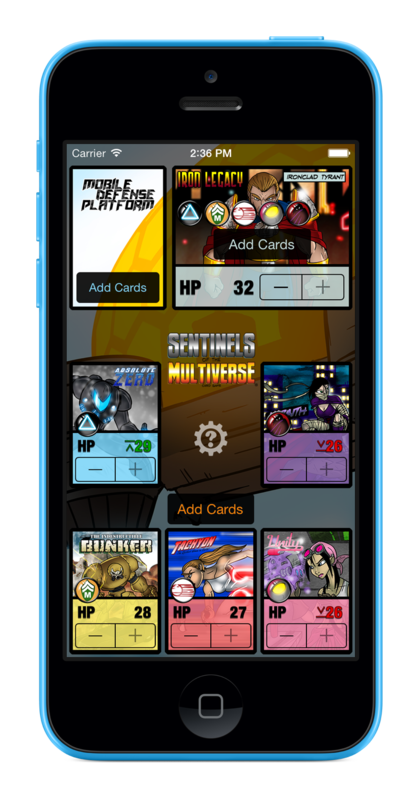 The “Nemesis” mechanic has always been a part of Sentinels of the Multiverse, making those hit points all the more important when a truly epic rivalry was afoot. Vengeance takes this mechanic and turns it up to 11 so it’s even more important to keep track of nemesis effects. The Vengeance & Nemesis Artwork Pack includes all of the wonderful nemesis icons from the base game and every expansion. You can easily see at a glance that Friction and Tachyon are still holding a grudge, or that Iron Legacy just can’t seem to get along with anyone. Finally on the artwork front, we didn’t forget about the promos! G.I. Bunker, America’s Greatest Legacy and several others finally have beautiful artwork to go with them. If you’ve purchased the High Resolution Artwork Pack in the past, you’ll want to visit the Tools menu and tap “Restore Purchases.” Then you’ll get the updated pack with the new artwork (you will not be charged again when you use “Restore Purchases”). 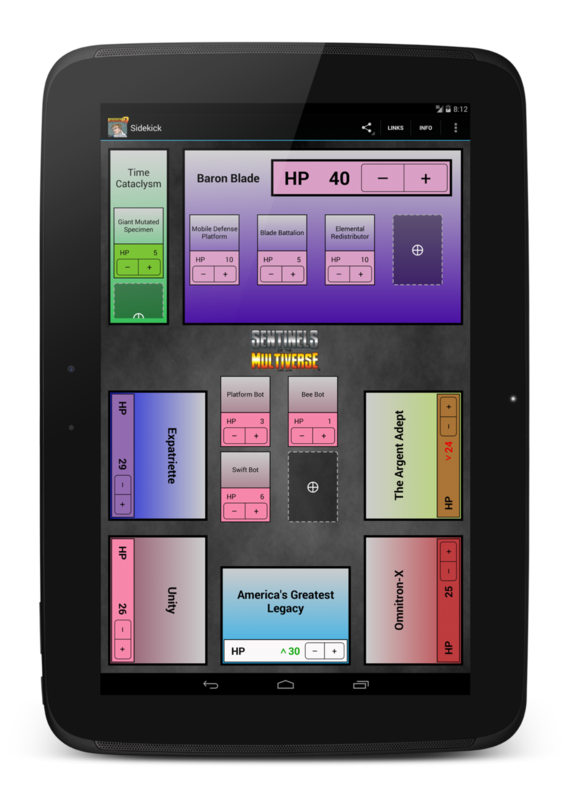 Sentinels Sidekick 2.3 is available now in the App Store as a free update for owners of previous versions. If you’re new to Sidekick, you can pick it up for $4.99. Baron Blade faces down the heroes on Android! Note: look & feel is subject to change before release. Also coming this month, the first official release of Sentinels Sidekick for Android! We know you’ve been begging us for it and it’s finally here. Since this is a brand new version of Sidekick, we’re planning on growing it along the same lines as we grew the iOS version (albeit, a lot faster we hope). Play with all Heroes, Villains, and Environments from the base game and the following expansions: Rook City, Infernal Relics, Shattered Timelines, mini-expansions and promo decks. Set up a Random game with up to 5 Heroes with one touch! Quickly look up rules, errata, discussions, and other game resources. If you don’t have a tablet (or phablet), stay tuned. We’re expecting to add Android phone support within the next few weeks. Features like official artwork, notes, and more are also on our roadmap to add in the near future. Our goal is feature parity with the iOS version, but that will naturally take time. Sentinels Sidekick for Android will be available first on the Google Play Store for an introductory price of $2.49. Get it while it’s hot! If you prefer to do your shopping on Insula Primalis (AKA, Amazon), fear not. We plan to bring Sentinels Sidekick to Amazon soon afterwards. That’s all the Sidekick news that’s fit to print, so get back out there and save the Multiverse!